Ebola has reached America’s shores. Listening to our politicians, you would be lead to believe that they have every thing under control. Yet all you have to do is log onto almost any social media outlet and you will see and entirely different picture. What’s most bizarre and frustrating about all of this is that neither the U.S. government or the Centers for Disease Control have provided any actionable information or advice to the American public. They maintain that they have the facilities to stop any such outbreak and continue to tout the narrative that there is nothing to fear, because they have it all under control. Notice how every drop of pure H2O has been removed from the shelves. 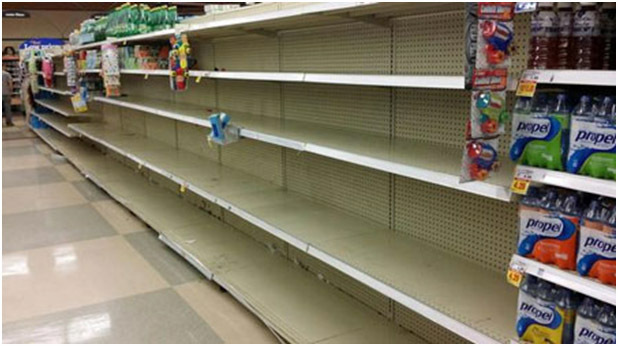 Imagine for a moment what grocery store shelves, pharmacies and hardware supply stores are going to look like within 12 hours of an Ebola infection or outbreak being announced on U.S. soil. Now, for all we know the CDC’s containment efforts are successful, and perhaps Ebola will be stopped in its tracks. But being naturally skeptical of our government’s abilities to mitigate such a virus, especially given the lack of any actual information from the CDC or government, we must assume that Ebola will eventually start popping up in the United States. When it does, the CDC and Homeland Security will likely announce a number of precautions that we need to take. Those precautions are going to include supply lists and strategies. Here’s the bottom line: If you don’t have your supplies before emergency announcements hit the airwaves, then plan on going without. If you want to take action ahead of millions of panicked Americans, then we urge you to follow the recommendations below. They come from informed sources and will be very similar to what the government will recommend in the event of an Ebola outbreak or pandemic emergency. – Schools, workplaces may close, and public gatherings such as sporting events or worship services may close temporarily. – Government mandated voluntary or involuntary home quarantine. Essentially, once this happens the whole system could potentially go into lock-down. The Organic Prepper and author of The Pantry Primer says that in this environment that you must take the No One Goes Out, No One Comes In approach in order to be absolutely certain no one in your household is exposed. I know this sounds harsh, but there are to be no exceptions. If you make exceptions, you might as well go wrestle with runny-nosed strangers at the local Wal-Mart and then come home and hug your children, because it’s the same thing. Once you have gone into lockdown mode, that means that the supplies you have on hand are the supplies you have to see you through. You can’t run out to the store and get something you’ve forgotten. That means if a family member shows up, they have to go into quarantine for at least 4 weeks, during which time they are not allowed access to the home or family, nor are they allowed to go out in public. Set up an area on your property that is far from your home for them to hang out for their month of quarantine. If at the end of the month they are presenting no symptoms, then they can come in. It sadly means that you may be forced to turn someone away if they are ill, because to help them means to risk your family. Now is the time to plan with your preparedness group how you intend to handle the situation. Will you shelter together, in the same location, and reserve a secondary location to retreat to if the situation worsens further or if someone becomes ill? Will you shelter separately because of the nature of the emergency? Decide together on what event and proximity will trigger you to go into lockdown mode. Make your plan and stick to it, regardless of pressure from those who think you are over-reacting, the school that your children have stopped attending, and any other external influences. If you’ve decided that there is a great enough risk that you need to go into lockdown, you must adhere to your plan. Those items should help with prevention, especially if you take the advice of locking down and staying home. However, we must assume that some of us, for whatever reason, will still have to make our way out into public. And with that assumption, we must also expect the absolute worst case scenario – an infection or suspected infection within in our own ranks. If you’re forced to exit your home, you’re going to want to be fully protected, and that includes covering your hands, eyes, nose, and mouth. In addition to the N-95 respirator masks mentioned above, you may also consider upgrading to the more expensive N-100 respirators recommended by the World Health Organization. Or, go with a full facemask. Insofar as your preparedness efforts are concerned, you may also be able to kill two birds with one stone here and go with a full face mask that includes NBC (Nuclear, Biological, Chemical) protection like the US-made NATO SGE 400/3 Military Gas Mask. If going with such a mask, be sure to include some NBC filters. For protection inside of your home, Tess Pennington of Ready Nutrition recommends building a sick room that can be used to isolate suspected infections or even to be used as a quarantine/observation area for friends and family who may be coming to your home as part of your group lockdown plan. The takeaway here is this: You cannot depend on the government to give you accurate information until it is too late. Moreover, emergency services personnel will be overwhelmed and you will have only yourself and those in your lockdown group to depend on. Plan on no outside help. That means you need to have food, water, and other supplies on hand. Additionally, if we have a widespread emergency that brings down the commerce system you may need to head out to barter and trade with others for necessary supplies that may have been overlooked. In such an instance you may also want to have some precious metals on hand for trade. The Silver.com price for silver today is about $20. It may be a good time to stock up on some emergency ‘cash’ like silver eagles or pre-1965 US quarters and half-dollars which contain 90% silver. These trade instruments are recognizable and may come in handy. Prepare now, because as we have seen with disasters past, waiting to do so until after the announcements are made will be too late. A pandemic may incapacitate (and/or terminate) a significant portion of the population, crippling the infrastructure due to lack of manpower and possibly leaving you without utilities and other services for the duration (months or longer). If a deadly virus were to infect the population and spread easily from person to person, a pandemic (worldwide outbreak of disease) could begin. No one can predict when a pandemic might occur. Are you ready to self-impose a quarantine for 30, 60, 90, 120 days? Surviving a pandemic is a matter of isolating yourself from OTHER INFECTED PEOPLE until the die-off has run it’s course. This could be many months or even longer. Since you won’t know who all is infected, you will need to stay away from everyone outside of your (hopefully healthy) group within your home sphere. Therefore in order to be fully prepared, you must have the ability to hunker down in your home without the need to go out where other (potentially infected) people are present. This includes going to ‘work’, shopping to get food and supplies, etc. You must have everything that you need already at home. During the onset of a pandemic, most people will not fully realize the ramifications and will continue to go about their daily habitual routines – going to work, going to the grocery store, etc. exposing themselves to the potential mortal consequences of exposure. Almost every transmissible disease has an incubation period during which the person is infected but not yet showing signs of disease. Quite often, a person can be contagious for one to several or more days before exhibiting symptoms. During the circumstance when someone within your group becomes infected, that person will have to be quarantined to avoid infecting everyone else. If you take in any new members to the group, they should also be quarantined to assure that they are not infected (many viral infections will manifest themselves within a period of 3-5 days, and most within 10-14). Ideally the quarantine area will be a separate building from your own living quarters, such as an outbuilding, garage, empty house, or barn. If you choose to offer a room within your home, choose one vented to the outside, without ducting connecting to the rest of the house. Make sure the room has a negative pressure by leaving a window cracked, so the air flows into the room from the remainder of the house and exits through the window. The following starter-list of prep items (focused on preps to do with pandemic) should give you some ideas in order to better cope with survival. The list and ideas are in part excerpted from the LDS Preparedness Manual which offers a well rounded set of advice on survival preparedness in general. The world is dangerously ill-prepared for the fight against pandemic outbreaks. While Ebola is currently raging and spreading (reason enough to prepare! ), other potentially calamitous threats are out there. MERS, SARS, avian flu and other illnesses could re-emerge at any time. While the list above is incomplete (for an overall preparedness plan), it should get you to thinking about your own preparedness. Search this website and others for further ideas and opinions regarding survival preparedness. D. Ask Tess: What is the difference between N95 and N100 respirator masks? Answer: Hello J.T., Ebola is a very concerning health issue going on in the world and one that I believe we should have a preparedness plan for. There are differences in the respirator masks on the market and knowing the difference between them can help keep you and your family safer. When the National Institute for Occupational Safety and Health (NIOSH) specified there be requirements for different respirator filters, they created three divisions for the filters with differing specifications: N series, R series and P series. Using masks with air-purifying respirators protects by filtering particles out of the air the user is breathing. There are seven classes of filters for NIOSH-approved filtering facepiece respirators available at this time. The difference between the N-series, R-series and P-series of masks has to do with whether or not the mask will be worn in an environment where oils and their vapors can be inhaled. In short, N-series filters are not resistant to oil, R-series filters are resistant to oil, and P-series filters are oil proof. The respirator filter ratings (95, 99, 100) refer to the percentage efficiency at removing particulates from breathing air. 95, 99 and 100 series filters are 95%, 99% and 100% efficient, respectively. N95 respirators made by different companies were found to have different filtration efficiencies for the most penetrating particle size (0.1 to 0.3 micron), but all were at least 95% efficient at that size. Above the most penetrating particle size the filtration efficiency increases with size; it reaches approximately 99.5% or higher at about 0.75 micron. Tests with bacteria of size and shape similar to Mycobacterium tuberculosis also showed filtration efficiencies of 99.5% or higher. In the case of preparing for Ebola, keep in mind that the Ebola virus strands can be as small as .02 microns in diameter, which are smaller than 3 microns. That said, the virus can permeate the filtered masks by a carrier such as (water molecules, bodily fluids, etc.). The best bet in assuring your family’s safety against Ebola is with N100 or P100 mask. Further, investing in other pandemic supplies would also be worthwhile. Have a one month supply of emergency foods that require no refrigeration. Store 1 gallon of water per person per day, in clean plastic containers. Avoid using containers that will decompose or break, such as milk cartons or glass bottles. Garbage bags to collect soiled clothing and bedding before they are washed. An extra supply of your regular prescription drugs and medical supplies. Ebola is in most people’s minds at the moment, more so since the United states and Germany took the decision to fly Ebola patients from West Africa to hospitals in Atlanta and Hamburg. 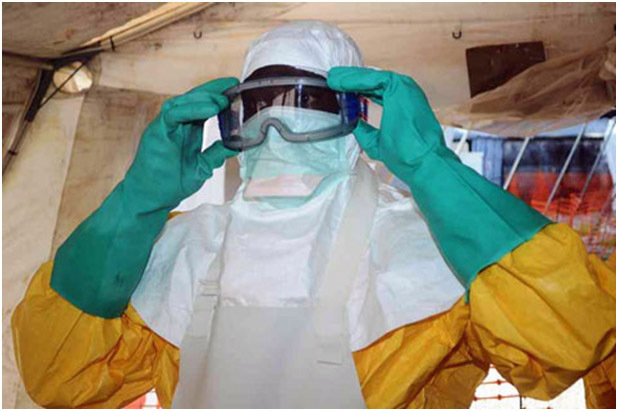 Ebola Zaire is one of five strains of Ebola that are currently known, only one, Ebola Reston is not fatal in humans. Ebola Zaire, the strain currently in circulation has a death rate approaching 90%. During pandemics or epidemics, which are localized disease outbreaks, our not so esteemed leaders will most likely start by 1) issuing advisories to avoid large gatherings of people, baseball games, football matches that sort of thing. 2) The next step is closures of such venues, games will be cancelled to limit the spread of the disease. 3) One up from this is the closure of large institutions, such as college campuses. 4) This is followed by the temporary closure of schools, and other public buildings such as council offices, job centers and libraries, and finally, cinemas and even churches may be closed. 5) Airlines may cancel flights or flights into and out of affected areas may be banned by government order to contain an outbreak. 6) The final imposed restriction is curfew. Individuals will not be allowed to move around freely in order to limit the spread of the disease. This decision will not be taken lightly by governments…unless they are thinking Agenda 21 and seize the chance to reduce the population by a few million. Enforced curfew means that many of those who have not prepared are going to die, either of dehydration and starvation, or by bullet when they break the curfew in their hunt for supplies. In view of the estimated amounts of unprepared people out there, security forces would in my opinion, be so overwhelmed by the numbers of those breaking the curfew they would not have the option of rounding them up, many will die. As an individual, you may have already decided not to send your child to school, you may have already driven across the state or even the country to get an older child home from college. You are, if you are reading this, probably well stocked and good to go if you decide to stay away from everyone until the situation improves. How long do you need to stay holed up for? When will it be safe to leave your home? What precautions do you take on returning if you really have to go out? There can be no rule of thumb for how long you need to stay isolated for, but if any of you think a month will do it you need to think again. Although diseases spread at different rates, have different incubation times and are infectious at different times during their course they all rely on one thing. A supply of suitable hosts. The supply of hosts, in this case us, is known as the herd, and providing the herd is big enough the disease will keep spreading. If the herd is too small, the disease will die out, this is the basis of shutting down sporting fixtures and campuses, reducing the size of the herd. Microbiologists, as a baseline figure will make an assumption based on how a disease has spread in the past. For example, that one infected person will go on to infect 20 others. Some diseases such as Hansen’s disease (leprosy) although contagious, has a much lower infection rate than this, other diseases such as pandemic influenza, are much higher. 20 is considered a mean average with a virulent flu strain. So one teacher can infect 20 kids. Each of those 20 kids can infect 20 more people, that makes 400 each of those 400 can infect 20 people, that makes 8000. Disease spreads very quickly, and if you have something with a short incubation period, you have thousands of infected people around at the same time. The problem is, so many of the worst diseases start off resembling the common cold, fever, aches, sore throat, headache. If presenting during the winter ‘flu season’ it can go un-noticed for even longer. By the time it is realized it is more than just a regular bug doing the rounds, the situation is well on its way to being out of control, it will keep spreading as long as there is people for it to spread to. How long you should remain isolated depends primarily on where you live. For those in towns and cities it will be for much longer than those living in rural retreats where human contact is minimal. Though those fortunate enough to live in such surroundings should remember that if the situation is dire enough, people will leave the cities looking for safety in less populated areas. In large centers of population there will be more people moving around, legally or otherwise, each of these individuals represents a possible uptick in the disease rates, allowing the spread to continue longer than it would have they stayed indoors and/or out of circulation. Even when the initial phase is on the wane, or has passed through an area, people travelling into that area can bring it back with them triggering a second wave of disease as people are now emerging from their isolation. On finding out there may be a major event in the offing, that people were becoming sickened I would dissect the information I had and find out as much as I could about the condition. This would not take more than an hour or two. On finding it is a definite threat I would go shopping….make sure that any holes in my preps are, as far as I am able, filled. I would be looking for the usual, easy cook long life foods and bottled water, lots of bottled water. If systems break down due to staff sickness or death other diseases may spring up and so many are waterborne I would store as much as I could. Waste collections may be affected, thick rubbish bags, and several more gallons of bleach to keep the outside areas of the home free from pathogens delivered by rats etc who will be attracted by mountains of garbage would be a priority. Lots of pairs of disposable decorators coveralls, disposable gloves and a filtered face masks would be next. If I had to go out these would be discarded before re-entering my home. Fly spray or fly papers should be on every preppers list, but most of us severely underestimate the amount we will need. Any crisis that causes rubbish to build will see a massive increase in their numbers, they are also effective germ carriers and spreaders and should be viewed as a threat to your general good health. Although they may not be capable of carrying the disease that is causing the crisis secondary illnesses often occur in such situations. The idea of shopping at this point is to preserve my stored preps for the maximum amount of time. Pandemics and diseases go in waves, often returning several times before the crisis is finally over. After the first wave has passed, there is no guarantee that life will operate as it did before. Depending on the mortality rate of the disease the population may have thinned considerably, the food chain could well be affected and municipal services may well have stopped or be severely reduced. The last minute shopping trip could well be the last time you are able to supply yourself with what you need. I would continue these trips, gathering as many extra supplies as I could until I heard of the first case within one hundred miles of my home. At that point self-imposed isolation comes into effect. One hundred miles is my buffer zone for disease, of course it could already be in my city, but practicalities dictate that I will not stay away from people because hundreds in Europe are dropping like flies. Maps of disease spread look like a locust swarm moving across the country and this allows disease spread to be tracked on an hour by hour basis. One of the few instances where mainstream media will be useful. Once the doors were locked we would stay there for at least two weeks after the last case within 100 miles is reported. A government all clear would be weighed against how long it had been since the last case was reported in the area I have designated as my buffer zone. There is of course still the chance that someone from outside the area will bring the disease in with them causing a second wave of illness. You cannot seal off cities to prevent this. Going out after self-imposed isolation should be kept to a minimum for as long as possible, and if you don’t have to, then don’t do it. Far better to let those that are comfortable being out and about get on with it and see if any new cases emerge before exposing yourself and your family to that possibility. As with most things we prepare for there is and will continue to be massive uncertainty during times of crisis. Diseases can be unpredictable and are capable of mutating at an alarming rate. New emerging diseases, and re-emerging diseases are often zoonoses, that is diseases that jump the species barrier from animal to human and these unfortunately can be the most unpredictable of all. The continental United States has seen unprecedented heat in many areas of late, drought conditions prevail in many areas. Animals will migrate in search of water, as humans have done for millennia. Bubonic plague is present in many animals in the Sierra Nevada area, hantavirus greatly favors dry conditions. West Nile virus and other mosquito spread disease is on the increase. Last winter the UK saw numerous floods, rodents are on the march, looking for drier, higher ground. They bring with them a massively increased risk of leptospirosis. Cholera is now not only a problem in Haiti, but in Cuba, having reached Havana earlier this week. Cuba to the closest point of Key West is 90.5 miles…inside my buffer zone limit though admittedly the ocean makes spread less likely than if they were joined by land and the cholera is not yet epidemic let alone pandemic. Pandemics have occurred before and they will happen again. Localized epidemics are quite common. A little thought as to how you would deal with not only the contagion but the other issues that could arise from it may well save you a great deal of grief in the long term. No crisis remains isolated, each and every one of them will have a knock on effect, you may survive the pandemic, but what about the three months worth of rubbish in the streets, the plague of rats and the thousands of unburied bodies left in its wake? Think ahead and have a plan, and as I have learned from so many preppers, have a backup plan.